The original ‘Trainspotting’ was a cultural phenomenon when it was released in 1996, with the posters adorning the walls of many students and the terrific soundtrack capturing its moment in time perfectly. Because of this, it’s natural to approach the sequel with a degree of trepidation, particularly given modern cinema is littered with sub standard cash in’s, but I was relatively confident based on a really good trailer and the return of the original cast (and Danny Boyle as director). It’s also based (loosely, I understand) on Irvine Welsh’s sequel to the original novel and the gap between the films has allowed the actors (and therefore the characters) to age naturally. I’m glad to say that I thought ‘T2: Trainspotting’ was an excellent sequel and the result is a film that pays tribute to the original and its past without feeling like a retread. The film picks up with the four core characters from the first film twenty years down the line, with the way the characters lives have panned out not entirely surprising to those who had watched the original. In the early parts the film mostly tells individual stories to catch us up on each character and it works really well before the storylines start to coalesce together as the film’s plot starts to take shape. The plot follows a fairly similar pattern to that of the first around a big deal that brings the friends together, but it does feel secondary to the focus on characterisation and that’s no bad thing. The film is incredibly funny, not least in a hilarious sequence at an Orange Lodge, and with pretty much every moment involving Begbie, and the soundtrack is once again outstanding as it successfully blends newer tracks alongside reworkings of old classics from the original. Danny Boyle’s filmmaking always feels like it has its own relatively unique style and I thought his work was superb here, energetic, kinetic and really effective in terms of the editing approach in particular. Perhaps what surprised me most was how reflective and melancholic the film was, occasionally bringing a lump to the throat, particularly when Spud was involved. The film has a lot to say about the nature of memory and the aging process, and how people can become stuck in cyclical patterns of behaviour as a result of their past and their upbringing. It’s in these moments that the film really excels and works on the audience, and I also thought it’s commentary on modern masculinity and how that shapes us, particularly through a couple of great scenes as standout Robert Carlyle starts to peel back the layers and reveal his insecurities, was great. I’m younger than the characters in the film but I felt a real connection to the journey’s they’ve been on and how they feel at this stage in their life, and I think Boyle did a really good job of evoking a sense of nostalgia without letting it overwhelm the narrative of this film. 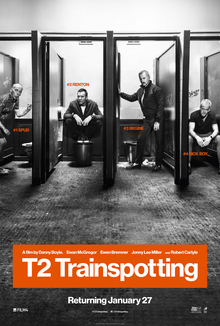 A sequel to ‘Trainspotting‘ wasn’t something I can ever recall looking for, but I’m glad it came along in the end. It’s an excellent sequel that manages to both entertain and resonate emotionally and for me, it was worth the wait.